This is part of the series of releases which has brought the Vienna Haydn Sinfonietta and BIS together in some of Haydn’s most extraordinary work. Having already been mightily impressed by the lively freshness of the Overtures and the nice big box of court music, I was more than a little intrigued about a little-known aspect of Haydn’s creative output, that of the marionette operas. 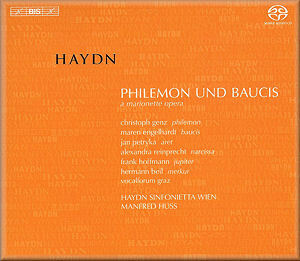 Philemon und Baucis is the only known survivor of Haydn’s work in this genre, and even this is incomplete. With only fragmentary sections of the score extant, this recording resorts to a version prepared for a production in Paris in around 1800. This followed a standard practice of the time, shoe-horning work by other composers to turn the piece into a viable stage production. Names which appear include Gluck and Carlo d’Ordonez, and bits from other works by or attributed to Haydn, including the famous ‘Chorale St Antoni’, are also worked into the final track-listing. Without knowing these things you wouldn’t notice anything particularly odd going on, and there is a good sense of continuity here which transcends the remedies involved in reviving the remnants of a remarkable score. The marionette opera was no children’s entertainment in this period, and the story is as infuriatingly complicated as any serious opera of the time, especially ones involving those wilfully obtuse classical gods. The puppets would have been life-size, and Manfred Huss points out that Haydn appears to be contrasting the artificial nature of the marionettes by giving them “music that is especially poignant and powerful in expression”. There are indeed some lovely moments, just one such highlight being Aret’s aria Wenn am weiten Firmamente, with a beautifully played oboe obbligato. The singing is good throughout, though the vocal demands of the score require no really coloratura fireworks. There are also some highly dramatic moments, from the sturm und drang of the overture’s Allegro con espressione to an especially effective storm scene helped by realistic sound-effects. The spoken texts are done in well enunciated German and with a superbly gravelly Jupiter played by Frank Hoffmann. These do not dominate, and in any case there are English translations of all texts in the booklet. As with the other releases in this series which I have encountered, this is a beautifully recorded production, lively in dynamics and with a warmly embracing surround-sound element. This probably gives a richer and more resonant acoustic picture than one might have encountered in the original grotto-like Marionette Theatre described in 1784, but makes for attractive listening in this case. With no weak points and bags of refreshingly performed strong ones this is a self-recommending release for a very wide audience.